A UT Austin police department spokesman told Breitbart Texas they do not know who the perpetrator(s) of the graffiti are. There is an investigation that is still ongoing. He also acknowledged there are surveillance cameras on campus. 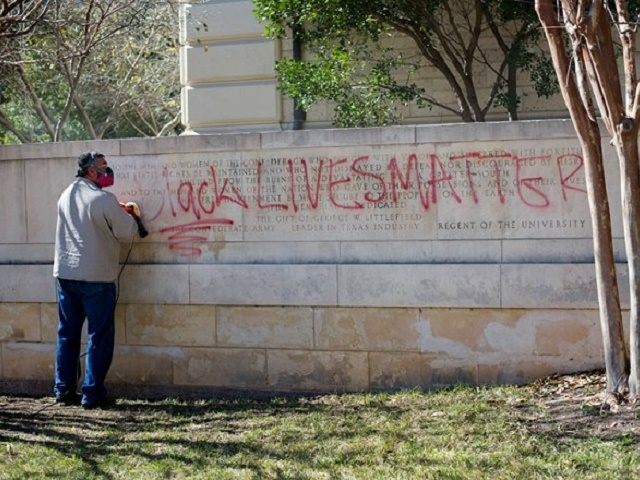 The Daily Texan, the newspaper serving the UT community, reported that the graffiti appeared on a half wall in front of Homer Rainey Hall, and on the statutes of Albert Sidney Johnson, Robert E. Lee, John H. Reagan, and James Stephen Hogg on Wednesday. These were defaced with “BLACK LIVES MATTER” and “#BLACKLIVESMATTER” in red paint. On Monday morning, David Joseph was shot and killed by an Austin Police Department officer. Both are black men reported the Austin American-Statesman. The naked young man did not have a gun or weapon. The Statesman reported that an attorney for the boy’s family said, “How much of a threat could a boy pose to police under those circumstances?” The attorney, Scott Medlock added, “His mother wants to know why this happened, why her son would be found in this state and why they would respond by shooting him.” The family has called for a “full and fair” investigation into the shooting. Austin City Councilwoman, Ora Houston, questioned how the situation was handled when it appeared that Joseph was in a state of mental health crisis, reported the local paper. The place where Joseph was shot is in her district. The Daily Texan reported that there is an audio recording of the officer repeatedly telling Joseph to stop. Only some of the footage from the incident was caught on camera. McCarrel posted a haunting message on Facebook just hours before he took his life saying, “My demons won today. I’m sorry.” His last tweet said, “Let the record show that I pissed on the state house before I left.” There were no witnesses to the shooting. McCarrel organized activists and protests in Ohio after Michael Brown was shot in Ferguson, Missouri, in 2014. He was also the founder of an organization for the homeless called Feed the Streets and a youth mentorship program called Pursuing Our Dreams, reported the New York Daily News. He had been homeless for three months after he graduated from high school and this experience was reported to have inspired him. At that time, the incident marked the third time the statue of Davis had been vandalized in 2015. The property damage came after South Carolina Governor Nikki Haley called for the removal of the Confederate flag from state capitol grounds. Members of the UT student body mounted a campaign to remove the Davis statue, and the statue was removed in late August 2015.